Unleash the inner outdoorsmen and MacGyvers among your team, staff, group, family, or circle of friends with the Rafting Expedition package! The series of tasks in this package is a great option for groups to bond and have fun on the water while being challenged with a communication and team work-centered, time-sensitive task. This package also provides a great platform for typically more quiet and reserved members of the group to potentially take charge and display leadership skills. While this is meant to be a fun day, it is also a great tool for managers and higher-ups to get to know their team members and employees in a different way and gain knowledge about them they wouldn't get from typical workplace scenarios. Problem-solving, negotiating, time-keeping and observation skills are all needed to complete this activity - but most of all you need to want to have fun! A team consists of 6-10 people each and they are responsible for building a water-worthy raft able to stay afloat with participants aboard. We provide all the items necessary; however, teams must bargain and perform tasks to acquire their items from our “Raft Trading Post”. 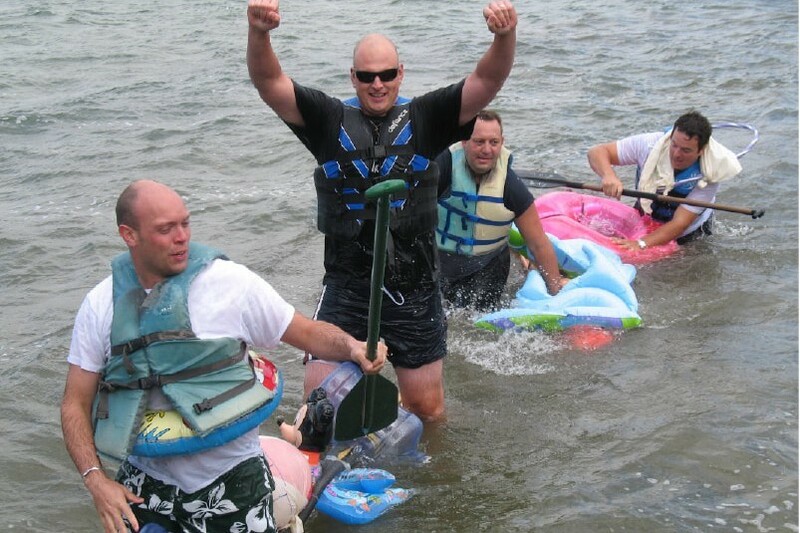 Once the trading is completed, teams will assemble their rafts and name their vessel. The final portion of this exercise is to test the crafted rafts at our gorgeous lake front! Each team will select three crew members to race against the other teams. Of course our judges will have medals and special awards to be handed out at the completion of the race.